(a) An arrangement of dimerized molecules of κ-H3(Cat- EDT-TTF)2 on the 2-D plane, b-c. (b) An anisotropic 2-D triangular lattice made of spin-1/2 molecular dimers. Antiferromagnetically coupled spins normally align in the opposite direction to one another. On a triangular lattice, when two spins (red and blue arrows) align antiparallel, the third spin cannot decide a direction either up or down (and its energy became unstable). This frustration effect restricts spins from formation of an ordered state. (c) 2-D molecular layers bonded by hydrogen atoms. Researchers at the University of Tokyo and Japan's National Institute for Materials Science have discovered pure organic substances exhibiting the quantum spin liquid state. Water loses kinetic energy as it is cooled, and when water molecules become unable to move, water becomes solid (ice). Similarly, electron spins in magnetic materials normally align and form a solid state at low temperature. Recent theoretical studies suggest that spins on a triangular lattice maintain their liquid state (quantum spin liquid state) even at an extremely low temperature. However, a substantial understanding of this phenomenon, such as whether the quantum spin liquid state really exists, and if it does exist, what kind of spin state it is, has not yet been obtained. To clarify these matters, efforts have been made over many years in the quest for quantum spin liquid substances. A group of researchers at the University of Tokyo's Institute for Solid State Physics, led by Professor Hatsumi Mori, project researcher Takayuki Isono (currently a NIMS postdoctoral researcher), and research associate Akira Ueda, were engaged in searching for hydrogen-bonded single-component pure organic semiconductors. In this process, in partnership with another research group led by Unit Director Shinya Uji at the Superconducting Properties Unit of the National Institute for Materials Science, they discovered that electron spins in a pure organic substance, κ-H3(Cat- EDT-TTF), were in the quantum spin liquid state. 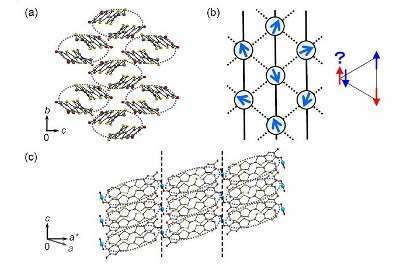 A detailed understanding of quantum spin liquid is expected to present a new direction in the course of research into the superconducting mechanism of high-temperature superconductors and the development of new data storage and communication technology.